The bass/midrange drive unit is the heart of a loudspeaker. While the cabinet and crossover make an important contribution to the overall sound, limitations of the drive units place a very real restriction on the absolute level of transparency and musicality achievable from the loudspeaker. Some shortcomings of poor quality drive units can be mitigated using an over-complex crossover, but this brings other problems. Quite simply, it's far better to devote time and resources to optimising the drive unit at the outset. Providing you have the expertise to do so. We are proud to work with the finest designers in the UK today, including Derek Hughes and David Lyth. On the face of it, a dynamic moving-coil loudspeaker is a very simple piece of technology: just a powerful magnet, a coil of wire, and a conical diaphragm. But any electro-acoustic system - be it a microphone, a pick-up cartridge on a turntable, or a loudspeaker - is riddled with complexities because physical objects have mass and the ability to flex, meaning that they will distort and resonate, colouring the sound. The starting point is a strong chassis to hold all components in perfect alignment with each other. The voice coil moves within a very narrow gap, a gap that must be kept as small as possible to maintain an extremely high flux density, but at no point in the life of the unit must the voice coil be allowed to touch the magnetic pole pieces. If that happens, gross distortion results, leading to eventual failure. For larger drive units, die-cast aluminium is essential to maintain perfect alignment. Aluminium is a good conductor of heat, which helps to cool the motor assembly, and a cast frame is well-damped, meaning that it doesn't "ring" audibly. The diaphragm makes a critical contribution to the sound quality, and both the material and the shape are important. 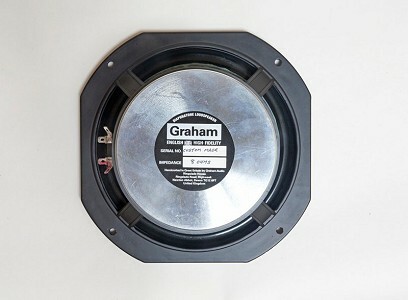 For many years, nearly all bass and mid-range loudspeakers used paper diaphragms. Paper can be formed into almost any shape, and it is relatively light, which is good for efficiency. But many decades ago, the BBC found that ostensibly identical drive units were highly inconsistent from sample to sample, which meant that completed loudspeaker assemblies sounded different to each other - a disaster for professional use where consistency is an absolute requirement. This was such a problem for the broadcaster that they started their own intensive programme of research into alternatives to paper - initially settling on Bextrene, but then discovering polypropylene. The loudspeaker industry as a whole benefitted from the BBC's research, and various forms of polypropylene are widely used today. 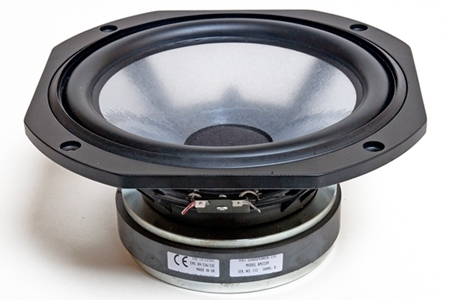 The LS3/5 used a 5 inch Bextrene drive unit from KEF, and the LS5/8 and LS5/9 used polypropylene diaphragms - developed because of a need for greater efficiency and consistency from larger units. Careful research into the exact profile of the diaphragm has been carried out to determine the ideal profile. It's a surprisingly complicated problem, but the main difficulty comes about from the fact that the diaphragm does not behave as a perfect piston over the entire frequency range. As the frequency increases, the inner parts of the cone begin to move separately to the outer parts, which is desireable because the whole diaphragm is too heavy to reporduce the higher frequencies. But this behaviour must be well controlled and consistent, otherwise it can be a significant source of colouration which will inevitably fall within the critical mid-range area. This is especially challenging for a 12 inch woofer, as used in the LS5/8 - a unit which required many months of detailed analysis to complete. Connected to the outer edge of the diaphragm, and is one of two components that form the suspension. It is especially critical because it is part of the radiating surface - literally an extension of the diaphragm itself. Many different materials have been employed in this role over the years, and many problems have been discovered along the way. For example, it's well known that foam surrounds begin to decay after approximately 10 years - the exact life-span depending on many environmental factors. 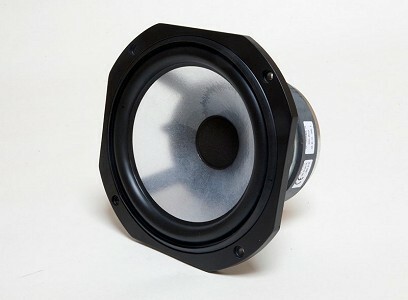 Fortunately, these are rarely used for high quality loudspeakers, but they are attractive to designers because of their light weight and low cost. Various plastics have been used, and the BBC was especially fond of PVC because it offered good mechanical termination for the outer edge of the diaphragm. This means that standing waves that can set up within the cone itself at certain frequencies are well damped and hopefully inaudible. But PVC has a big problem. Over many years, it will become stiff, and can even start to shrink back to its original flat shape, gradually losing the half-role that allows movement of the diaphragm. Once this process begins to happen, the sound of the drive unit changes considerably, and the effects can readily be observed using measurement equipment. Sadly, surviving examples of many BBC loudspeakers are suffering from this problem to varying extents. 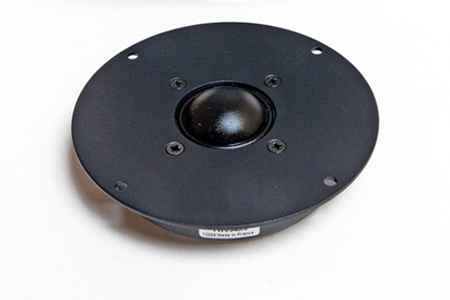 Rubber surrounds can work extremely well as they provide good damping and are very suitable for use with both Bextrene and polypropylene diaphragms, and are used in many high quality designs, including ours. Ultimately, a high quality drive unit will have had a surprising amount of attention paid to the surround. The choice of material, the precise shape and size of the half-roll, and even the choice of glue used to attach the surround to the diaphragm will have been carefully considered and optimised. Fundamental to the loudspeaker, the combination of voicecoil and magnet are another critical area for the loudspeaker designer. Distortion and colouration can be caused if inadequate attention is paid to the geometry of the pole pieces either side of the magnetic gap. High temperature materials are essential to assure the long-term reliability of the loudspeaker. Even the dust cover that protects the voicecoil gap from foreign objects makes a surprising difference to the performance. Fortunately, Audax still manufacture the 34mm soft-dome tweeter that was selected by the BBC for the LS5/8 and LS5/9 designs. Every unit that we use is measured - relative to our reference samples - and we have been highly impressed with the improvements in quality control and consistency that have taken place since the 1980s. For other designs, we collaborate with SEAS, who are one of the biggest manufacturers of drive units, and are especially recognised for their tweeter designs. Consistency is one of their strengths, which is crucial for our no-compromise loudspeakers.